“Hey, Kiki! Catch! This is for you.” My mother-in-law Sheila tossed me a Barnes & Noble Booksellers bag. I caught the flying green sack and peeped inside. I love gifts, absolutely LOVE them. And I adore books. So I just knew she’d gotten me something special. 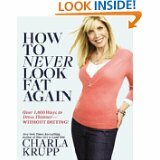 I pulled out the book and read the cover: How to Never Look Fat Again. “What a rhymes-with-witch and starts with a B,” Clancy Whitehead said. Clancy is my good friend and co-worker, a walking, talking fashion icon who channels Jackie Kennedy. No lie. I’ve been with Clancy when people have asked her for her autograph. “Not much of a compliment now that Jackie is dead,” she grumbles. “You aren’t seriously going to read that, are you? It was an insult.” Clancy smacked the book with her open palm. 1. Thin starts at the top. Part your hair off-center and wear side swept bangs. 2. Show a little skin. Simplify your life and elongate your face and neck by wearing V-necks. 3. Batwing arms? Rely on ¾ sleeves, or push up long sleeves. 5. Go up a size in tops to avoid back fat. 6. The average woman gains six pounds during menopause. 7. Learn to love shapewear. 8. Denim should be lean, clean, long and dark. 10. Never wear more than four layers in the winter. I went home that night and threw out half my wardrobe. I turned one of my jewel-neck tops into a V-neck. I tossed my faded jeans into the wash with a packet of dark navy dye. I found an old silk scarf, long and narrow, that matched my “new” top. The next morning I put all those pieces together and wore my “after” outfit in to work. The UPS man asked me if I’d lost weight. So did our first three customers. Read Kiki Lowenstein's most recent adventure Make, Take, Murder. You should check out How Not To Look Old, too, Kiki! I can live with everything except rule #7. Have you tried those? Sausage-casing! Why on earth would women at an age where they tend to run hot anyway encase themselves in plastic? Besides, it doesn't pull anything in, it just pushes flab out the ends. And, I might add, it's so tight that only a contortionist could get one on or off. Have you ever been in a store dressing room with one stuck around your middle? What does your husband say/do about his mother? Krista, shapewear isn't that bad! Depends on the amount of control. Some are "light" control and actually really comfortable. Really! Of course some are terrible--my sister once got stuck in some head-to-toe shapewear thing and had to ring for the sales lady to help her out of it! Lila, you must be one of those fitness buffs. Huh. I get a lot of exercise cutting paper--and nothing is coming off my hips. Liz, my husband died in Paper, Scissors, Death. He thought his mother was a pill, but he loved her. Jennie, Joanna has a copy of How Not to Look Old. She says she'll loan it to me. And yes, ladies, that shapewear is tricky. Sort of like those fingertraps we used to play with as kids. Sorry, Joanna. Think my mind was on hold yesterday.